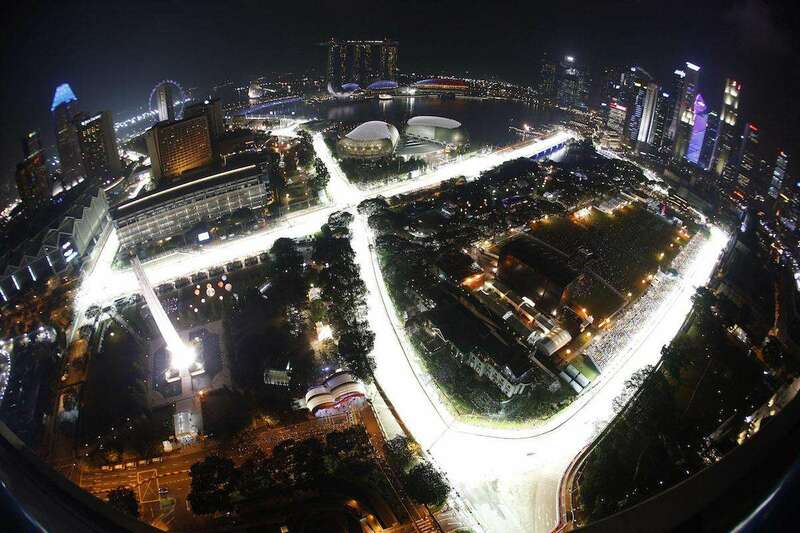 Get the most out of your trackside experience at the Marina Bay Street Circuit for the Singapore Grand Prix. The next race takes place on September 14-16, 2018. 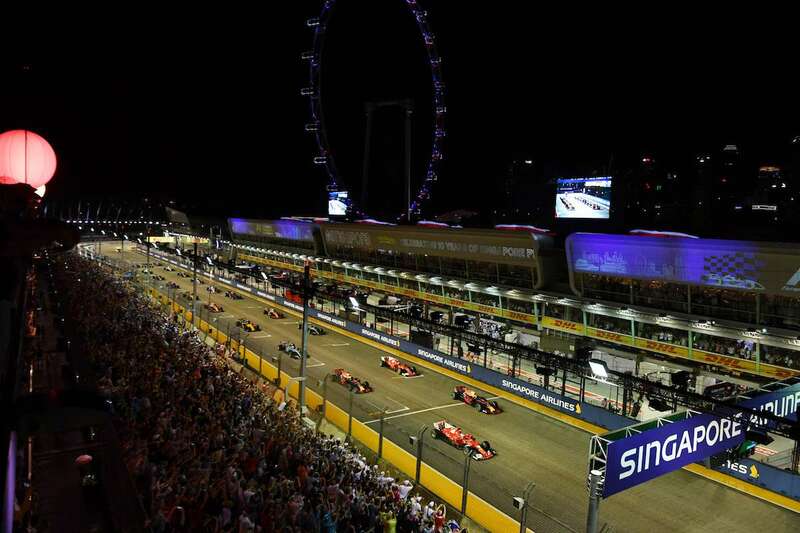 More like a rock festival than a Formula 1 race, it’s no wonder Singapore has firmly cemented itself as a fan’s favorite since joining the F1 calendar in 2008. The trackside atmosphere at Marina Bay is electric and the organizers put on an big show which goes a long way to justifying the high ticket prices, including A-list concerts and a spectacular fireworks display after the race has finished. It’s hot and humid in Singapore. Dress in light, loose clothing (leave your jeans at home), pack an extra top if you are prone to sweating a lot, and wear comfortable shoes. Don’t forget to check the weather forecast for any signs of rain, as late afternoon storms are not uncommon at this time of year in Singapore. The circuit is open from 2pm to midnight on Friday and Saturday, and 3pm to 12:30am on Sunday. There are ten access gates, each of which has an express lane if you are entering without a bag. If you are carrying a bag, you will need to queue to have it examined. Leave large items such as folding chairs at home; you won’t get in with them. Food and drinks are also not permitted in the circuit, apart from one plastic bottle of water or soft drink up to 600ml in size. Singapore is unique on the current Formula 1 calendar for the way in which the circuit is divided into four zones. Some tickets provide entry to all zones, whilst other tickets only provide entry to one zone. If you are also keen to see a particular concert, ensure that your chosen ticket provides access to the zone where the concert will be held. More entry about the different zones at Marina Bay is in the Tickets section of our guide. Read our Getting Around guide for more information on the best way to get to the circuit, including the closest metro (MRT) station and recommended entry gate for your grandstand. In addition to around 6 hours of F1 action, Marina Bay will host two additional racing series in 2018; the Porsche Carrera Cup Asia and Ferrari Challenge Asia Pacific. There’s no other single-seat racing apart from Formula 1, which is a little bit disappointing. 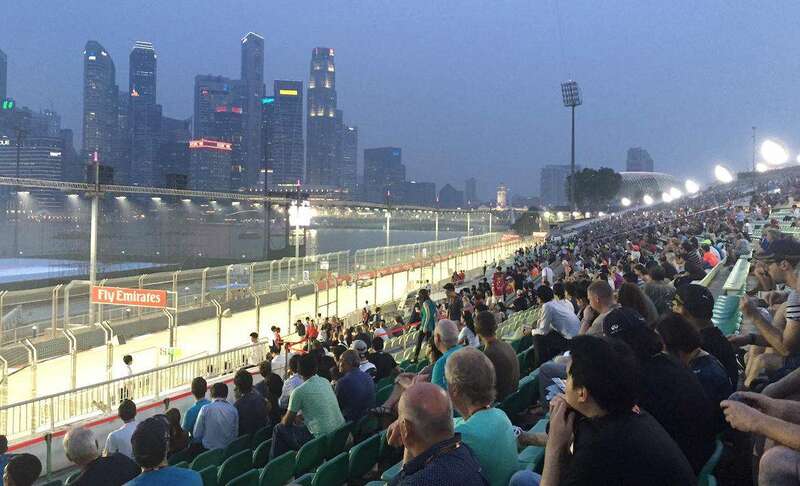 Marina Bay feels more like a music festival than a motor race at times! You’ll find multiple stages around the circuit plus roving performers from all over the world, including illusionists, theater and circus-cabaret acts. The main Padang stage in Zone 4 hosts the biggest headline concerts which close out the program on all three days of the weekend: Jay Chou on Friday, The Killers on Saturday and Martin Garrix on Sunday. Padang also features earlier concerts each day featuring Liam Gallagher and Dua Lipa. The smaller Wharf stage in Zone 1 also hosts concerts from Simply Red and The Sugarhill Gang. A whole host of other acts are set to appear this year; read more here. If you are determined to get a good spot for one of the headline concerts, we recommend getting to the stage area early; you will probably miss some of the on-track action, which is unavoidable given the tight scheduling. See the podium celebrations after the race: access is granted to fans in Zone 1 via a gate at the public viewing platform in front of the Turn 1 grandstand. A gate is also opened right opposite the podium allowing fans in the Pit Grandstand to enter the track. Get your favorite driver’s autograph: your best bet is to stake out the entrance to Gate 8, which is reserved for VIPs and team personnel. The drivers normally arrive around 3-4 hours before the start of the F1 action each day. Check out a video taken by our reader in this area a few years ago. Best view of the circuit: the Singapore flyer offers discounted rides throughout the weekend to holders of Zone 1 and 2 tickets. Food and drink stalls are dotted around the circuit, with the biggest concentration in the Padang area of Zone 4 and near the Singapore flyer in Zone 1. Look out for the ‘hawker’ villages which sell a range of tasty Asian fare, including satays, noodles and curries. Prices are reasonable at around $10-15 SGD for a plate of food. A large beer will set you back around $12 SGD, cheaper than at the majority of bars outside the circuit, whilst 500ml soft drinks cost around $4-5 SGD. Here’s some recent trackside menus: example 1, example 2, example 3, example 4. If you are on a budget, there are plenty of cheaper outlets for food and drink just outside of the circuit if you want a quick break, some of which are air-conditioned. Just remember you can’t bring back any food or alcohol back into the circuit. There are even a few regular supermarkets where you can stock up within the circuit, including near the Singapore flyer in Zone 1. Toilets are mostly of the portable type, but they are clean and queues are uncommon, even on race day. Been to the Singapore GP? Tell us your trackside tips in the comments. I don’t think the Singapore Flyer will be free for Zone 1 ticket holders. I hear it is only a 10% discount off advertised prices. Thanks for the information David, we’ve updated the guide. Hello everyone, I’m trying to decide if I should buy tickets to the Singapore Grand Prix for only Sunday which is race day or if I should get the package for all three days? I never been to a GP race before but I’m thinking is paying the extra three to $400 worth going for all three days. I’m after some advice if possible. My family and I are coming for the 2018 Singapore GP. My husband and Father purchased 3 day passes. I’m planning in attending on Sunday with a 1 day pass. Are you aware if children can share tickets? My kids are only young so I was going to bring one in the morning for a few hours and the other in the afternoon. Hi Nicole, please read the General Terms and Conditions. It looks like tickets are not transferable, sorry. 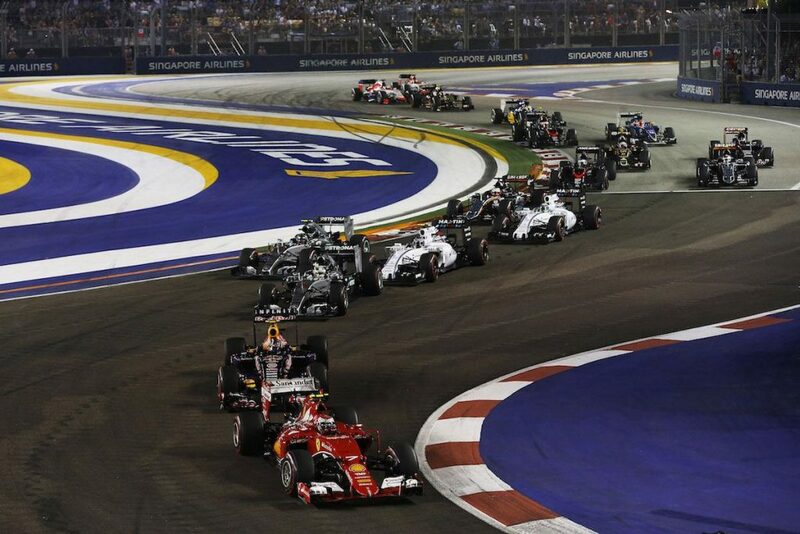 I am planning to come to the Singapore F1 Night race next month. I have looked at the previous blogs and discovered that the track will be open for fans after the final track activity and the checkered flag when the race finishes. I want to go onto the track and feel the atmosphere on the racing track after the race. Therefore i have a few questions as follow. Is the track only open to zone1 ticket holders after the race finish? Or can zone 3 and zone 4 holders access the track after the final track activity on sunday? Also, i would also like to know the exact location where the track is open and where i can access the track(e.g. near turn 20) after race finish. Hi Hin, it would be better to have Zone 1 access after the race, but I think anyone can go on the track. But if you have Zone 1, you can be one of the first. They open the track up at various points, near the last corner and first corner mainly. I got on to the track from Zone 1 last year and got a good view of the podium, but be warned, you will then be ushered off round the track and like me who wanted to visit that Padang Stage, missed my exit gate and ended up exiting the track near Turn 11, but I’ve noticed on one certain Webpage, that they’ve shown a walking route which would be helpful. If you are allowed on the track from other zones, I don’t think it would be at a time to catch the celebrations and if you are allowed on the track from any gate, depending on the time, you may then be caught in everyone getting ushered off and won’t be able to walk back in the opposite direction towards the pits. As per the article advice, or you could hang around outside one of the nearby hotels like the Pan Pacific or Ritz Carlton, where many teams and drivers stay. I have tickets for the weekend (Friday till Sunday); do I have now also free Access to the autographsession from 18 till 20 houses? So yes, can you tell me where I have to go? Anyone know if there is any trackside FM radio broadcast for commentary? Hi, I just wanted to say a HUGE thank you. I had a dream come true attending Singapore F1 2018. I’m sure it wouldn’t have been the same without your informative and excellent guides. I stayed in the Holiday Inn Express Clarke Quay, which beat my expectations. Local travel by foot, trains and taxi was affordable and straight forward, even with mobility issues. I used crutches and sometimes a mobility scooter.. I treated myself to hospitality at TwentyThree, expensive, but everything you could imagine was included. Time for me to research Brazil! Again, thanks. Just looking at tickets for this year and debating hospitality… the only thing is that I would only really want it for race day and then looking at somewhere like Turn 2 for Friday and Saturday but I can only see 3 day options available on most ticket options. Did you do TwentyThree for all 3 days or mix and match? – and if so, how? Also, is the track view reasonable from TwentyThree?